Please join us for our September monthly letterwriting meetup!! 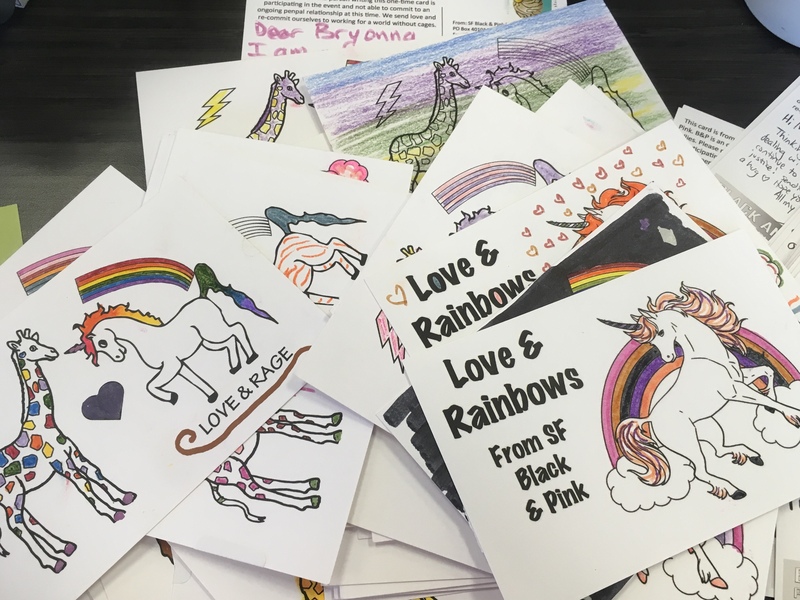 Letterwriting is one way we can help our incarcerated LGBTQ+ family remember they are an important part of our community, that they are not forgotten, and that we are still fighting for them!! You can write a one-time letter, find a new ongoing penpal, and learn about the many ways we, and others, are fighting to tear down prison walls. Food and drink available for purchase at the bar – please support this amazing venue that supports our communities! TGIJP has published their next issue of the newsletter Stiletto! It is being sent in to 1,800 people, most of whom are TGI, inside of prisons, jails and detention centers along with distributed to our recurring donors and movement allies. 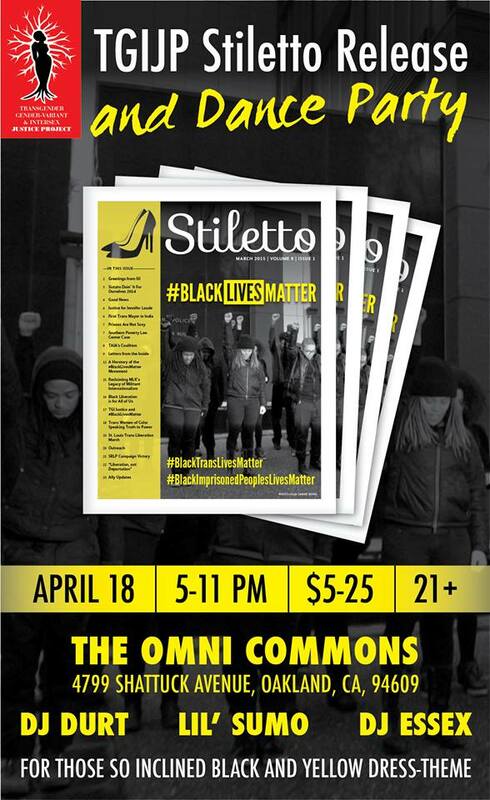 For this round, they made Stiletto bigger than ever with articles by members inside and movement allies outside. But now they need to cover the cost of production and distribution, so they’re throwing a huge party. A bunch of Flying Over Walls folks will be there volunteering and supporting, so come on through! We’ll be hosted by TGIJP for our next workshop! There will be a few similarities from our last workshop, but we’ll be focusing a little less time on exploring all the ins and outs of the PIC in order to have more time to spend envisioning alternatives. We’ll bring some snacks, and invite you to as well! In this workshop, we will look at what the prison industrial complex is, the ways LGBTQ+ people are policed, and what we mean when we say abolition. Through presentation, activities, and discussion, we will break down “crime” versus “harm,” what we really need to feel safe, and how we can envision alternatives to prisons in order to create a more just world. 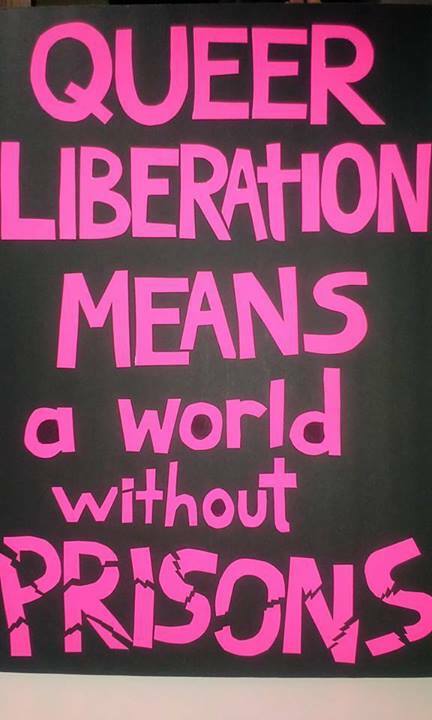 We strongly welcome folks who have been incarcerated as well as those who wish to work in solidarity (workshop facilitators have not been incarcerated and will make space for people to share personal experiences). We will also draw on materials from Critical Resistance, Black & Pink, and Captive Genders. The workshop is 100% free to the public but we will be asking for donations to give back to Critical Resistance & TGI Justice Project (TGIJP). We hope this workshop will motivate folks to take action against the policing and incarceration of LGBTQ community, become committed to dismantling the prison industrial complex, and possibly join us at our monthly LGBTQ+ Prisoner Letterwriting Nights or weekly TGIJP legal mail nights. Join us for our next Monthly Letter writing Night! 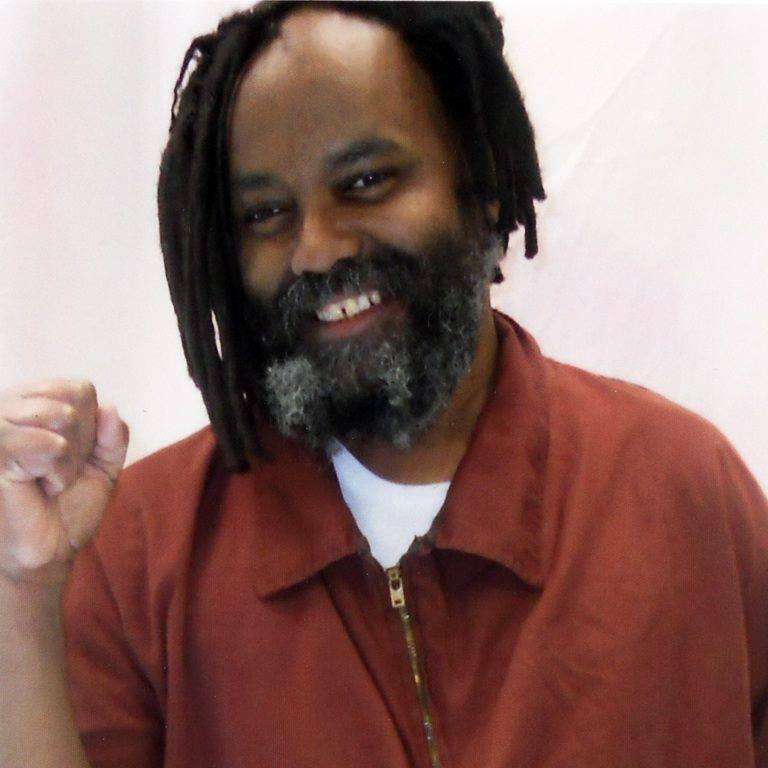 This month we want to highlight our solidarity with long distance revolutionary, Mumia Abu-Jamal who is currently in a Medical Crisis. Showing our support is critical at this time as Mumia doesn’t have access to internet and unless told, he has no idea that people are mobilizing on his behalf. He once credited his ability to survive Death Row was because he knew he was loved. May he never forget that. 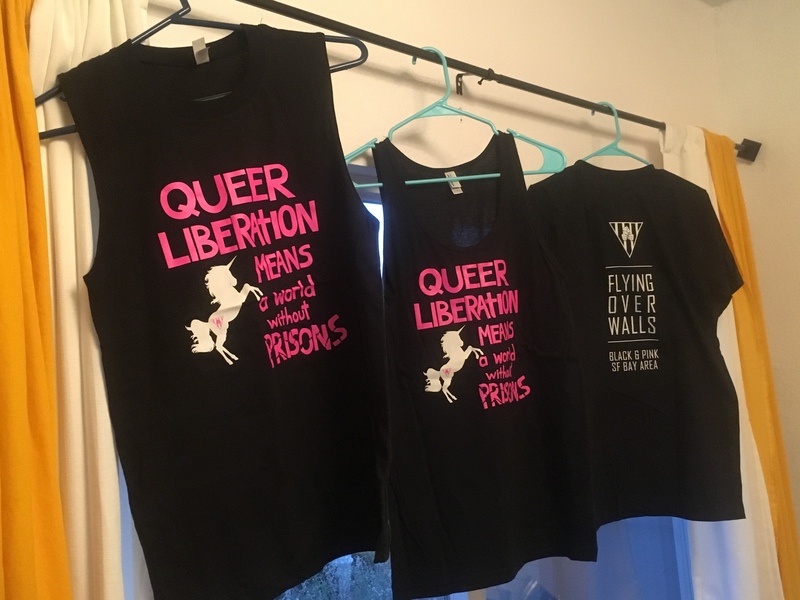 As the SF Bay Area chapter of Black & Pink, our focus is to connect the non-incarcerated LGBTQ+ folks who participate in our events to B&P members in Northern California prisons. We have all the writing and card supplies, provide addresses and info of folks to write to, provide a po box for letters back to you, and offer an orientation to new members at every letter writing night. We’re also here to offer support and answer questions. If you’re not ready for an ongoing commitment, you can still come to send a one-time card, learn more about the process and the PIC, and learn more about local organizing. We are about to have the last meeting of this round of our study group (thanks so much to everyone who participated and to Lauren & Charlie for organizing), and will be recruiting free word folks soon to join the next round of our study group. We will be matching each free world participant to an incarcerated participant for the duration of the group. We already have recruited our incarcerated participants. More details soon, and we will start in the late summer/fall! We will be tabling at SF Pride this year! Be in touch if you want to volunteer with us. 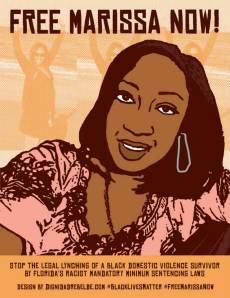 There is a March/vigil today at 3pm in Emeryville for Yuvette Henderson, continuing to demand accountability from EPD and Home Depot. Tuesday at 12pm there is a rally at SF City Hall as part of a day of resistance – April 14th is A NATIONAL DAY OF ACTION. April 17 is Palestinian Prisoners Day, and there will be a roundtable discussion. The ReVisions art exhibit and round table discussion draws connections between community struggles and cultures of resistance to challenge state violence, policing and prisons. April 27 is the Quest for Democracy Day– a day of grassroots legislative visits at the California State Capitol led by formerly incarcerated people, supported by Their Families, Friends, Allies & Comrades. April 29 – Training on meeting people where they’re at – This training will teach participants how to be conscious of the experiences and conditions incarcerated and formerly incarcerated people face, in order to improve participants’ advocacy. May 7 – Mariposa & the Saint – Join CCWP for a performance and a conversation about the shocking conditions in California’s women’s prisons and what can be done to change them. Oct 16-18 – 10 year anniversary celebration and conference for Black & Pink – if your penpals are getting out this year, please put them in touch with us, because they are invited to join this weekend and we will help them get travel stipends to get to Boston! 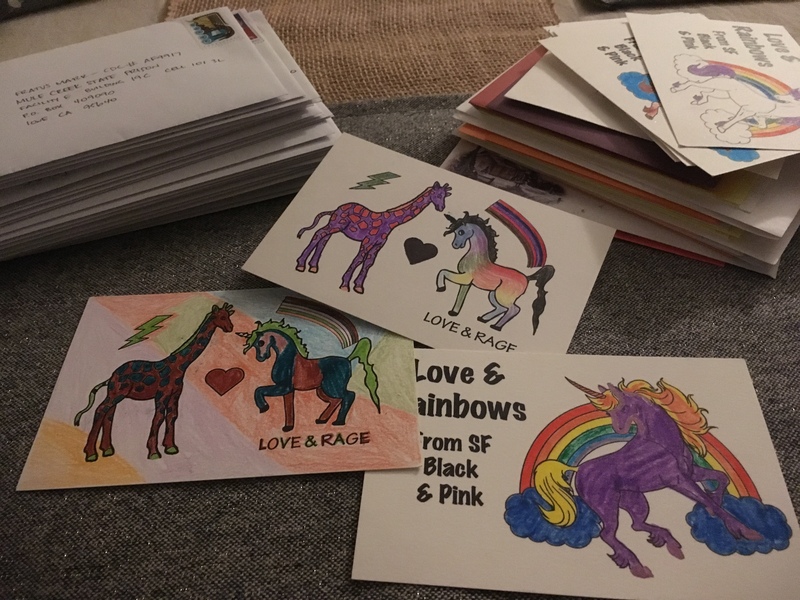 Multi-City Winter Holiday Card-Making Party for LGBTQ+ People in Prison! Miguel, a gay activist, artist, and migrant farmworker who has lived in the U.S. for 22 years, is currently living with HIV, Hepatitis C, and has fought cancer currently being monitored by doctors. He is detained in the Northwest Detention Center (NWDC) in Tacoma, WA, where it took about three months before he was able to see outside specialists regarding his various medical conditions despite his frequent requests to see a doctor. Due to his desperation, he was driven to attempt suicide in the first few weeks of his detention. Even though Miguel’s condition is unique and requires special medical care, NWDC has refused to release him on humanitarian grounds, asserting that they are equipped to handle someone with his medical problems. Miguel is asking for our help to pressure the ICE officers who have the authority to grant his release. Please call the Tacoma ICE office and ask them to grant the immediate humanitarian release of Miguel Angel Armenta Olabarria! (A# 076-343-950). Call ICE Officers Bryan Wilcox at 253-779-6080 and Nathalie Asher at 206-835-0058. Miguel Angel Armenta Olabarria! (A# 076-343-950) is currently living with HIV, Hepatitis C, and has fought cancer currently being monitored by doctors. and attempted suicide. It took NWDC about three months to begin giving Miguel the proper medical care he requires, which was only possible by reaching out to specialists outside of NWDC. Miguel is in no way a threat to community safety. Since his return to the United States in 2004, he has dedicated himself to LGBT and HIV issues and who has volunteer countless times to helping less fortunate children. As a member of __[your group/organization]_ I am asking you to immediately grant him humanitarian release while he awaits the decision on his asylum. Thank you. After you call, please forward this email and please spread the word!! Can you come to Miguel’s asylum hearing on October 30th at 1 PM in Tacoma? Please RSVP to Alex at axwest@gmail.com.